Sorry for the hiatus, I had to take a little time away from the blog to prepare for finals at school! But, that's behind me now and I can return to the important things, like fly fishing! Earlier this month I took a ride up to Fletcher, North Carolina to attend the 6th annual Western North Carolina Fly Fishing Expo. 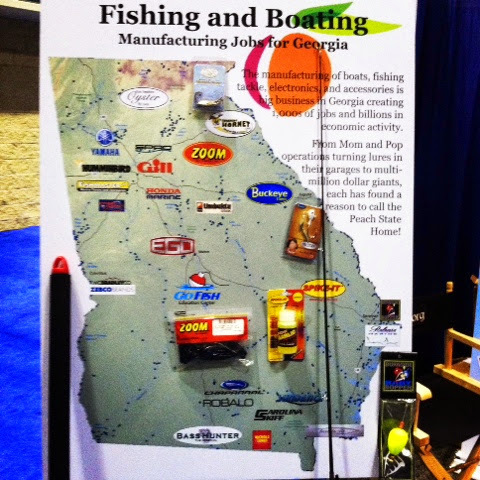 This is considered to be the Southeast's largest fly fishing event. 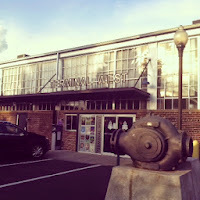 The show takes place in the Expo Building of the WNC Agricultural Center. There was a PBR rodeo happening at the same time as the expo, driving through the Ag Center there were a lot of nice looking trucks hauling horse trailers and cowboys and cowgirls walking horses through the parking lot! The expo itself consists of a large casting pond in the middle of the the big, open Expo Building with aisles of exhibitors down both sides and lecture tents in the back. 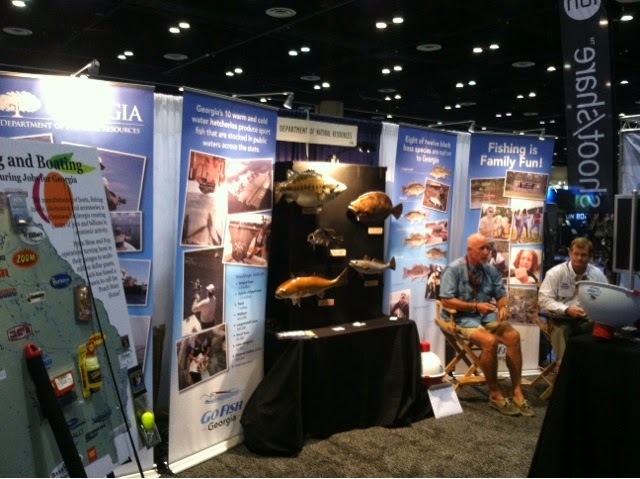 The two day show has become a live forum for local fly fisherman to see the latest gadgets and products from some of the top manufacturers, participate in lectures on a wide range of fishing techniques and scenarios and even get casting instruction from IFFF certified casting instructors. 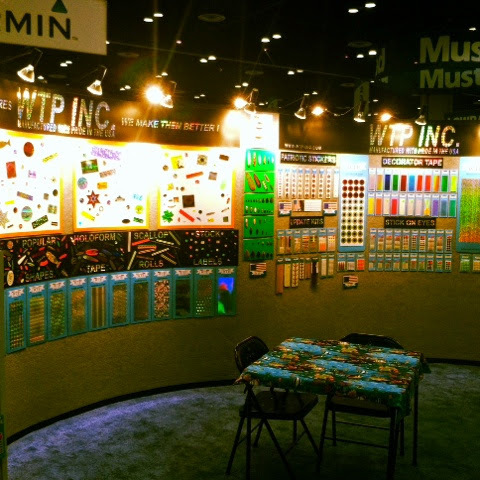 This was my second year attending the Expo and while it is a bit of a drive for me from metro Atlanta I enjoy the show because it has a very local feel. Most of the exhibitors and lecturers were either local to Western North Carolina or, at least, spoke on topics and techniques that pertained to the area. I think my favorite part of attending the show is getting to meet the folks that work in the local fly shops. 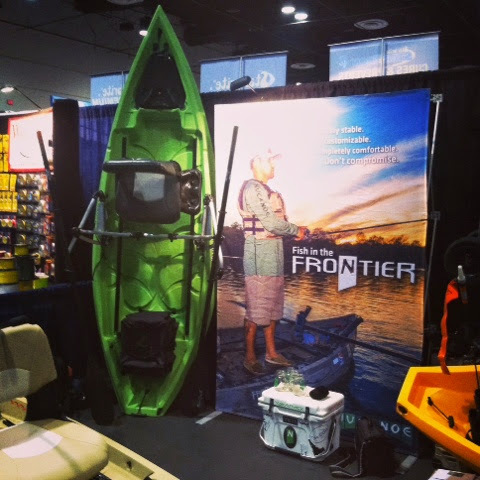 There were 10 shops represented at the Expo this year and each booth is like stepping into a mini version of the shop it represents, the folks are always very nice, excited to tell you about their shop, quick to invite you to their store and love to talk fishing and gear with any like minded individuals. 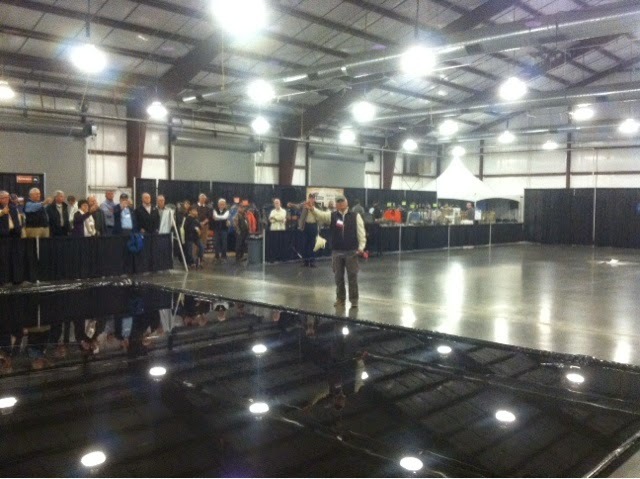 One of several demos at the casting pond. 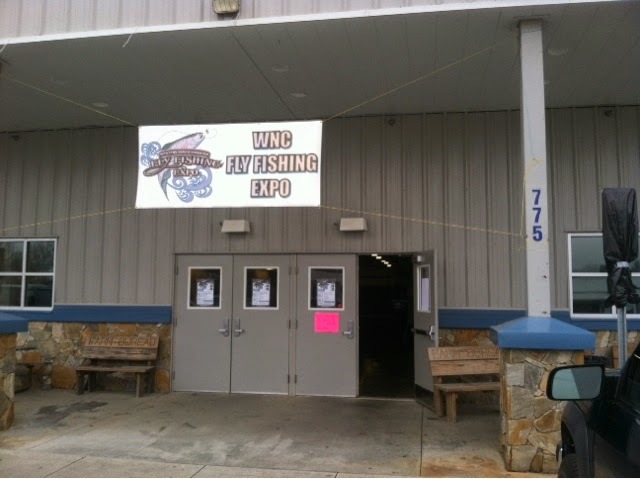 In addition to the manufacturers and fly shops, the show plays host to many booths from guide services, lodges, magazines and organizations such as Casting for Hope, Project Healing Waters (I got to talk fly tying and bluegill fishing with a couple great guys! 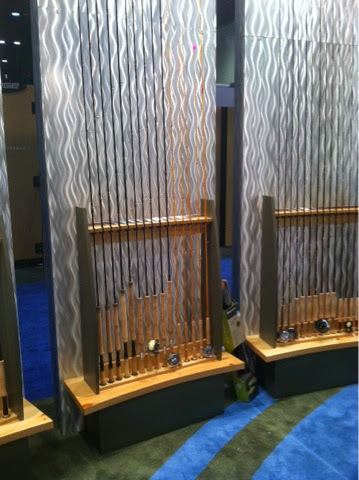 ), Federation of Fly Fishers and even a booth from the soon to open Fly Fishing Museum of the Southern Appalachians! Since I made the Expo a day trip from Atlanta, I only had time to take in two of the lectures. I attended Mac Brown's Dry Fly Tactics, Casting & Presentation where I learned about effectively fishing with dry flies and various techniques to do so. Some that I never would have thought of and would probably cause some of the uppity dry fly elite to get up and walk out! But, if it'll work it's worth trying! 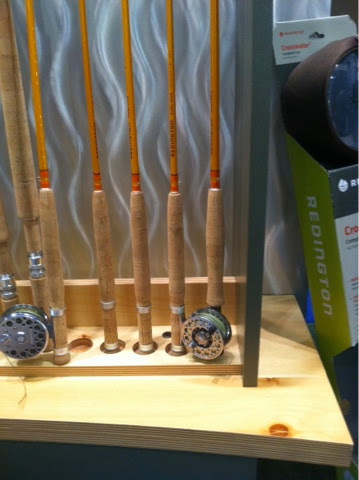 My second lecture was with Cameron Mortenson and his talk on the Reinvention of Fiberglass Fly Rods. Cameron's website, The Fiberglass Manifesto, helped to inspire me to start The Suburban Angler, so it really was an honor for me to meet him in person. 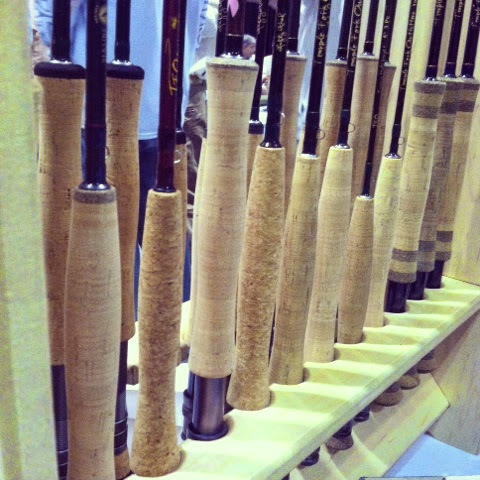 His talk on the history and evolution of fiberglass fly rods was fascinating. The only downside is, now I want to try fishing one!!! BBQ and Fly Fishing just go together! Since nobody likes to peruse fly gear on an empty stomach, the Expo invited a couple of food trucks out this year. 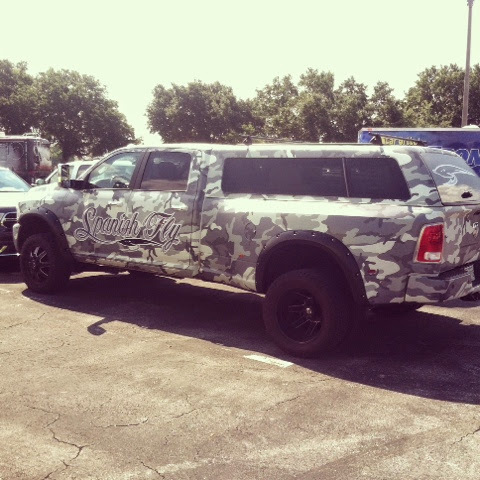 A local competition BBQ truck and a gourmet coffees truck were parked at the entrance to the building and the IFFF had a beer and snacks booth inside the show as a fundraiser. Luckily, I had $2 in my pocket so I was able to get the first Pabst Blue Ribbon I've drank in quite a number of years! For the second year in a row I had a fantastic time at the Western North Carolina Fly Fishing Expo and I really look forward to attending again in 2015! 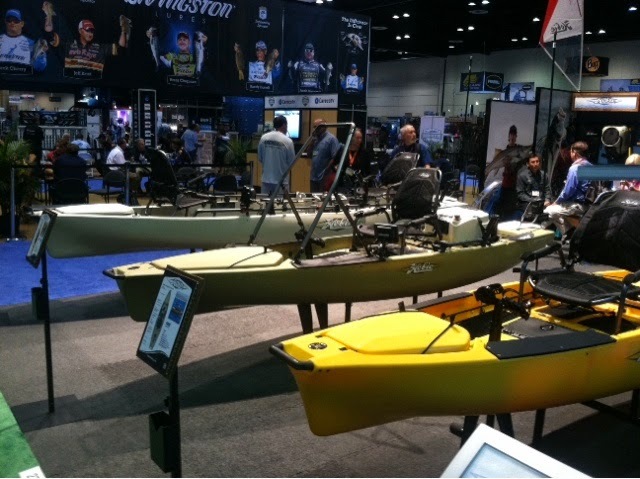 For more details on the show and the full list of exhibitors click here and if you'd like to hear an interview with Reba Brinkman, the Expo manager, and hear a shout out to The Suburban Angler, listen to The Fly Fishing Consultant Podcast with Rob Snowhite. I hope to see you all there next year! A while back I started to hear murmurings about a new fly box that was getting ready to come to market. It was supposed to be a revolutionary new design and far better at holding flies than anything that's come out before. When I finally learned the name of the box, I wasn't sure if they were trying to be cute and put some kind of gaudy decoration on a typical fly box, or if there was actually something sticky inside that held the flies in place. Now, if you're like me, you don't own just one fly box. I'm sure my collection pales in comparison to many, but I've got some with lamb shearling, some with little doors, some metal hooks all the way up to different foam configurations and foam with slits in it. 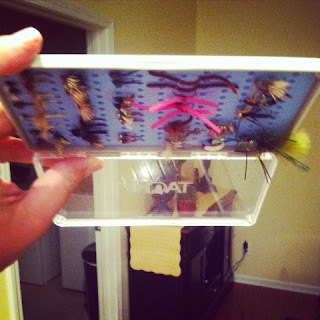 It really didn't seem like there was much room in the market for yet another fly box design. 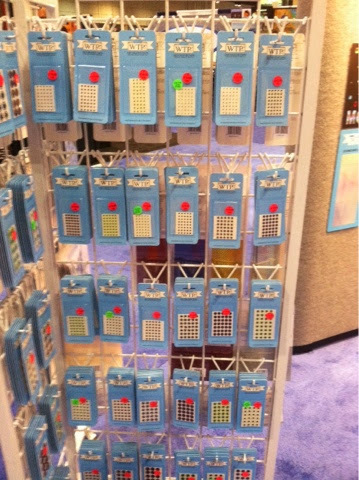 Then, I went to IFTD. 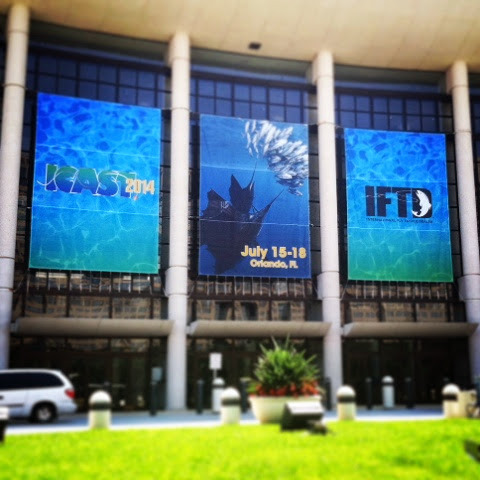 IFTD was an amazing place. 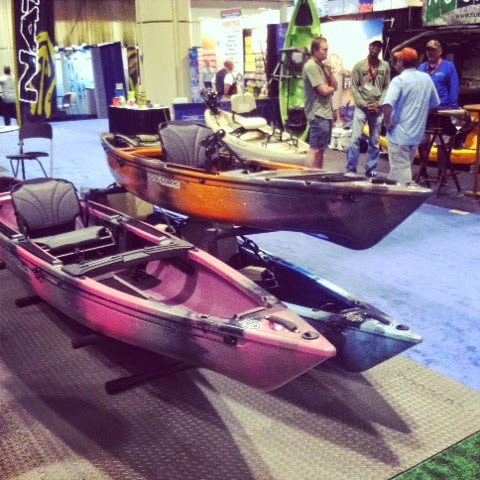 Lots of huge, colorful booths with everything a fly fisherman (or fisherwoman) could ever want. Me personally, though, I like to check out the smaller booths. It seems like that is where more innovation lies. 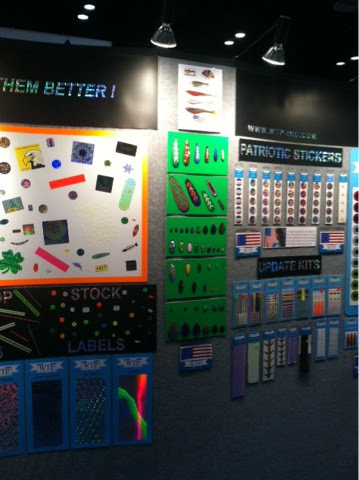 On one of my trips up and down the aisles, I came across the Tacky Fly Box booth. Finally, I get to see this box that I've been hearing about! To my surprise, the box was of a very simple design. No crazy accouterments or unnecessary gadgets, and a nice, slim profile that will slip easily into a pocket. I got to meet Tim Jenkins and Ki Aston, the founders and creators of the Tacky Fly Box, two incredibly nice fellows, both scientists (which appealed to my engineering background) and both Orvis endorsed fishing guides. Not only are these guys experienced enough to know what a revolutionary fly box should be, but they used the scientific method to reach a final design! How cool is that?!?! We talked about fly fishing for trout in Utah, and I tried to convince them that bluegill in Georgia were fun, too! 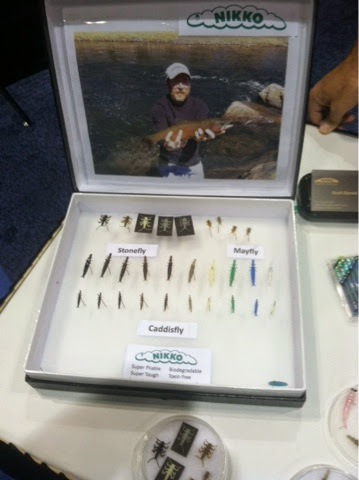 I tried to learn as much as I could about their fly box and how they went about designing and testing them. To my surprise, they very graciously gave me a Tacky Fly Box to try out for myself. 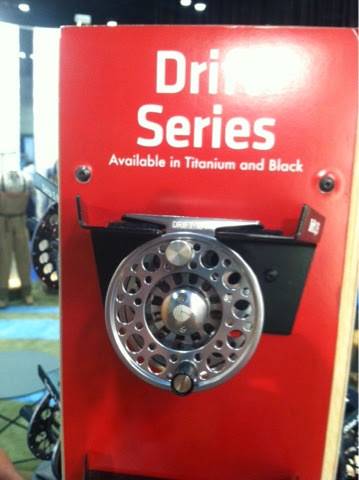 Are you willing to hold an open fly box upside down? 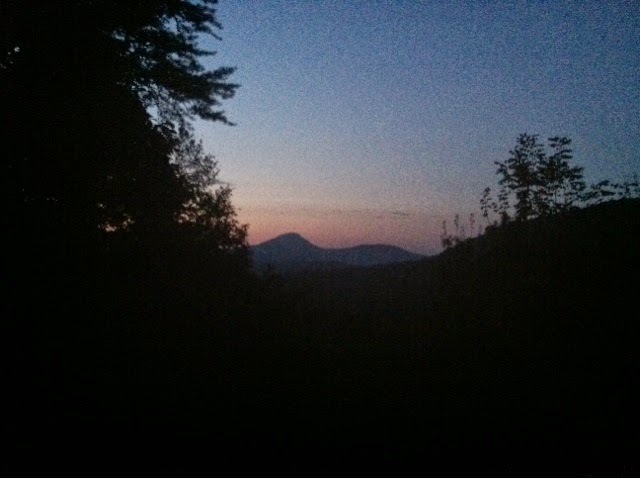 I couldn't wait to get back to camp that night. As soon as I got the fire started, I sat down and loaded up a bunch of flies into my new Tacky Fly box. I put everything I had in it. Then, started flinging it around like a madman. First with the lid closed (just to be on the safe side), then with the lid open! Not one fly moved. I mean, didn't budge! I was impressed! I've lost flies out of my boxes before because they weren't held in securely. I really wanted to test the holding power of the silicon mat that makes the Tacky Fly Box what it is. 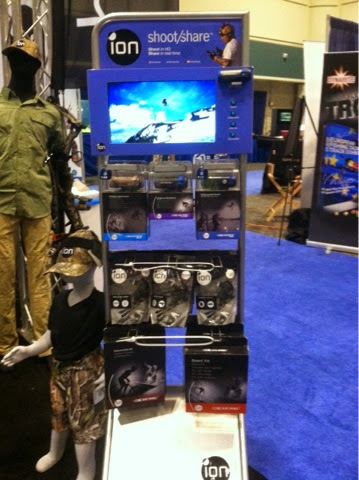 Friday night, after IFTD, I sought out Orlando Outfitters to find the biggest fresh water popper I could get my hands on! 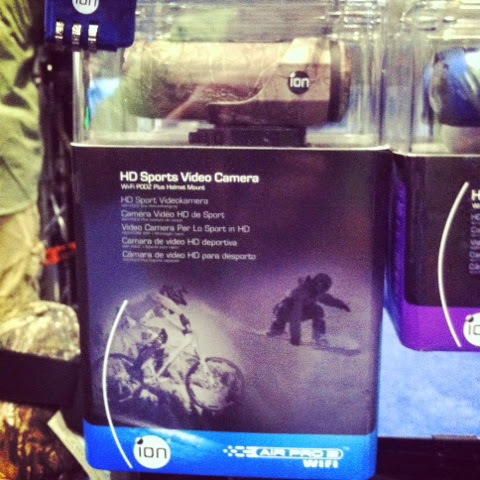 Orlando Outfitters is a great shop with some very nice, knowledgeable guys working the counter. 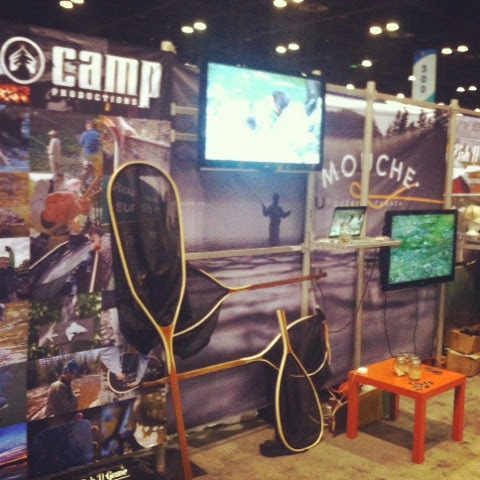 They've even started their own fly fishing expo to coincide with IFTD, I'll be checking that out in 2015!!! I picked up a handful of flies, and some more tying supplies (I'm really going to tie some flies one of these days, I really am!) while I was there. 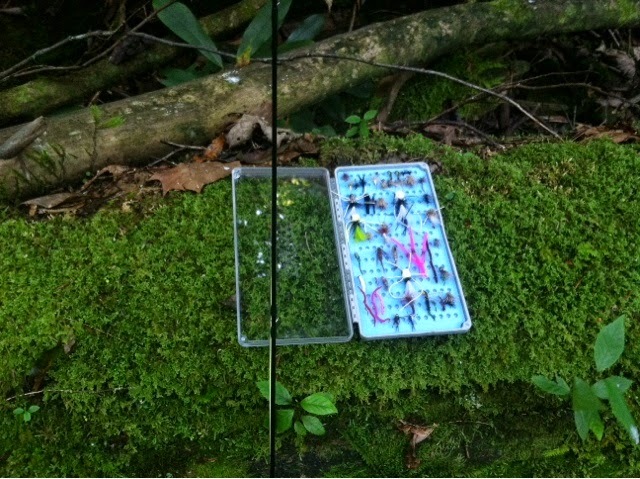 One fly in particular was just to test my new fly box: a size 4 Mossy Green BooglePopper. My ultralight rods will never cast this monster of a popper, but I had to see if the Tacky Fly Box would hold it! Hold it, it did! I put the big bug in the box and turned it upside down. Nothing. I gave it a shake. Didn't move. So, I gave it a fling. The only movement I could get from the popper was a bit of a rise. The silicon slits never let it go, though! I've been using this box for a few months now. It's really become my go to fly box, the first to get loaded up before I head out. It's thin profile makes it perfect to slide into a back pocket if you don't want to carry a pack or bag with you. My lumbar pack that I use fishing typically only holds 4 of my boxes comfortably, but I'm pretty sure I could double or triple that number with these Tacky boxes. Speaking with Ki, I've learned that they have some other sizes and styles in the works, so there will be no trouble with the lid closing on my big poppers when the new boxes are released. Another from the Tacky table. That's a lot of flies! The silicon insert is very durable, and, as I've said, holds the flies incredibly well. 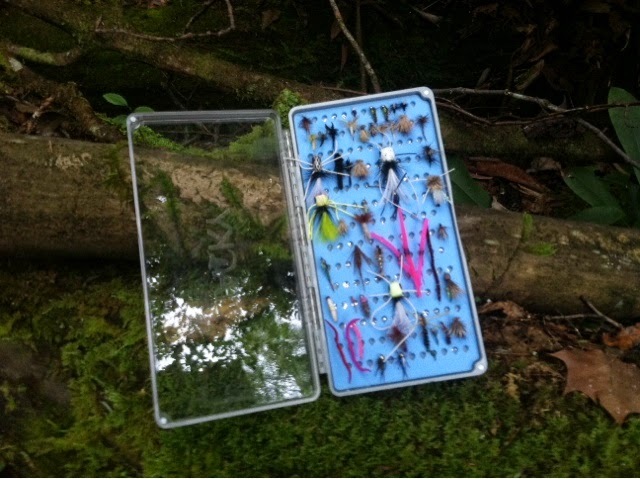 Have you ever left a foam insert fly box in a hot car or in the sun for too long? The foam will degrade and curl and the glue will even let go sometimes. That was a design consideration for the Tacky Fly Box. I leave mine in the car, in the sun, quite often and I have yet to see any signs of degradation to the silicon. I think this box is going to last a long, long time! Check out the video from Tacky of a Jeep driving over a Tacky Fly Box. I hope I never experience that with mine, but I feel a little better about accidentally sitting on it! I've broken a few boxes by forgetting they were in my back pocket! I have tons of praise for these boxes and I hope you don't find me credulous because of it. There is only one downside that I have found. I try to be very open and honest with my reviews, and my reviews are purely my opinion. I think most folks won't find this as a downside and it is a very small thing. I realize that we are in a global economy and country of origin shouldn't carry a whole lot of weight when making a purchase decision. The Tacky Fly Box is a very high quality product of which I am happy to own and very proud to have met the creators. However, the box is manufactured in China and that just tends to be a sore spot with me. I'm sure it was purely a "final-cost" decision, as US manufacturing can be expensive. I love the box, I use it constantly and I will definitely be purchasing another when the other sizes come out. I just wish they were manufactured in the USA. That's my review, let me know if you have any questions for me or the Tacky Fly Box guys and I'll do my best to get them answered. 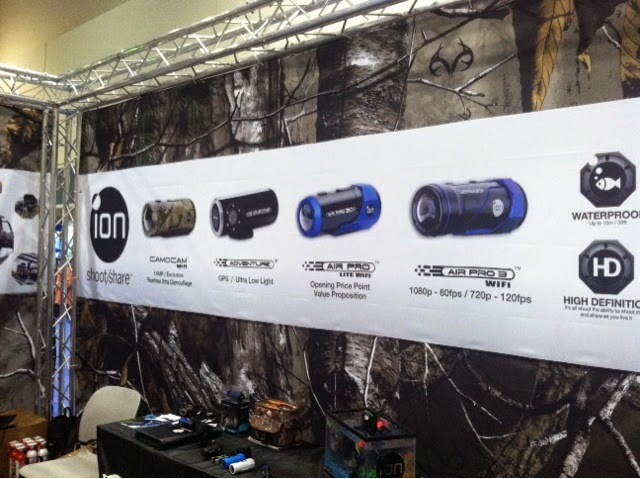 Check out these boxes, if your local shop isn't carrying them yet ask them to! You won't be disappointed! I can't wait to get another! Tight lines and Tacky boxes! 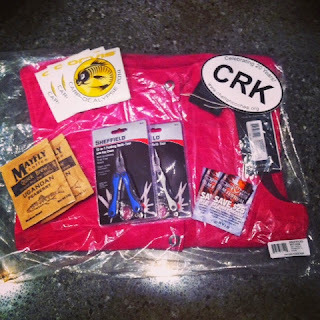 Post by Tacky Fly Fishing. 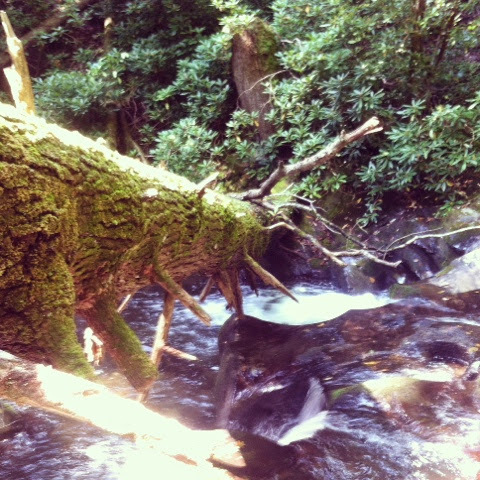 You can't have too many mossy log pictures, right? 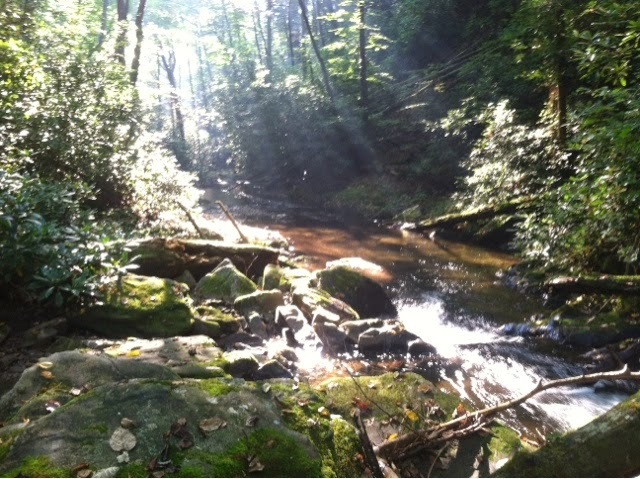 I wanted to share a few pictures I took while fishing the Upper Chattahoochee WMA last weekend. Its a really beautiful area up there, and it seems to be quite popular. My time was limited, so I didn't want to venture too far from the road and the car, so it was actually a bit difficult to find a spot that wasn't already occupied. There had been some pretty good storms in the area the night before and it had been raining most of the morning while I was there. I try not to let weather keep me from fishing, if I get an opportunity to go I try to take it. I thought the rain might improve the conditions as there had been some pretty low water up there. 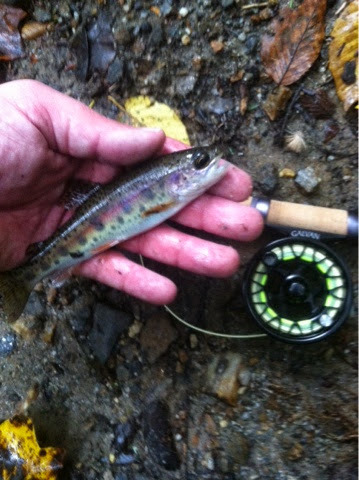 I went armed with the TFO Finesse Half Weight and the Galvan Brookie fly reel to get some more testing in for their upcoming reviews. I was very happy with the performance of each and look forward to the next trip with them. I fished a few different flies, but I seemed to get the most interest from a size 14 Elk Hair Caddis. When it comes to trout, I'm still very much a beginner. I'm pretty certain I missed a lot of strikes. Trout tend not to be as aggressive on the take as the bluegill I usually fish for! At least not in my experience thus far. After a few hours with as many splashy refusals, I was fishing around a large pool catching nothing but raindrops. I started working some large rocks and finally got a good take! I landed a beautiful little rainbow! He was a feisty little guy! 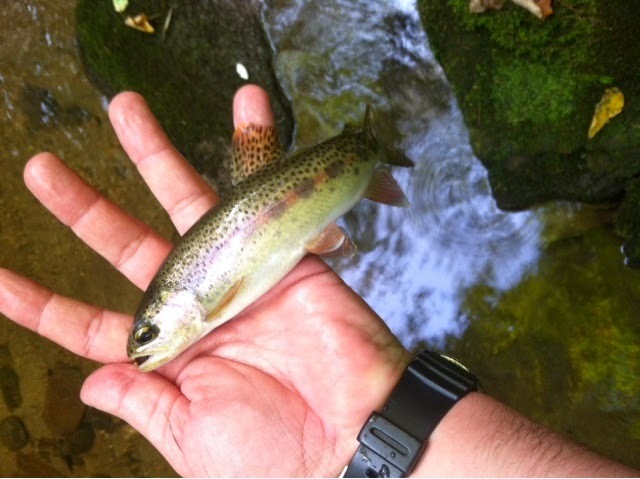 And, fishing a half weight, it was a ball to hook up on this little trout! With the acrobatics he performed, I don't think he had any idea that he was only 6" long! I returned him to his pool and hiked back up to the car to seek out another spot. 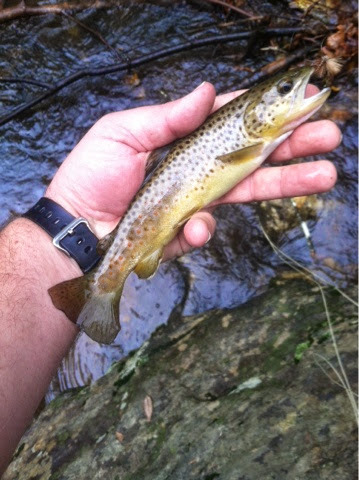 It was already after noon, and carrying the one-trout-per-trip curse, I was starting to consider heading home. 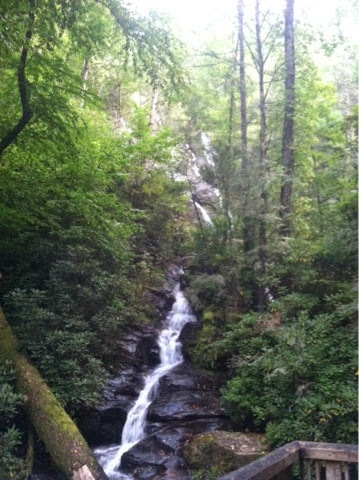 I absolutely love spending time in the woods, especially in the north Georgia mountains, so I was reluctant to leave. I found another spot that just had a "fishy" look to me ( Thanks to Tom Rosenbauer, I have a better idea of what that looks like now!). There was a parking area with a staircase down to the water, I tend to shy away from those places because I figure they're pretty heavily pressured, so I crossed the road and headed upstream a ways. 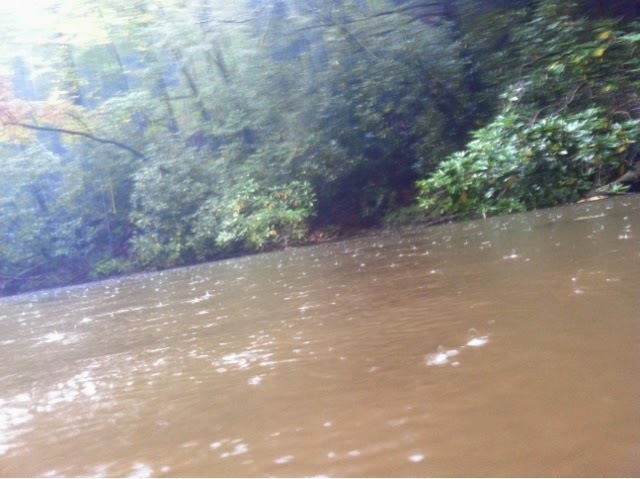 I don't have any waders yet, so I tend to bushwhack along the bank until I find a spot to fish. 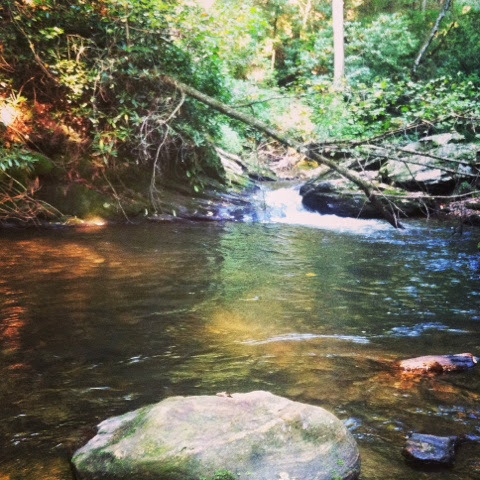 I got in the water and started fishing, working the rocks and riffles as I made my way back down toward the car. The car was back in view and I'd been fishing way longer than I intended (the Little Girl was on her way home from being away for the weekend and I like to be there when she gets in). After about 20 "one-last-casts", I got my caddis caught in some submerged branches. When I tried to break my tippet in frustration I felt the line move. A lot more than it should've being hung on a stick! When I got my first glimpse I couldn't believe my eyes! 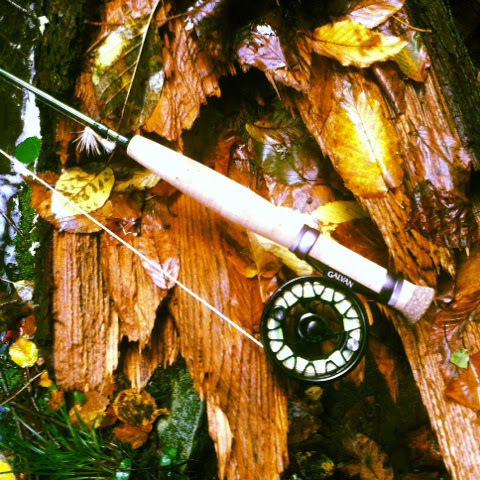 Not only was it not a stick, it was a trout! And a brown one at that! I had to work to get him around all the rocks and branches to bring him to hand, but I sure was happy when I did. This was my largest trout to date, it was my first brown trout ( a stunningly beautiful fish) and I caught it on a five foot long, half weight rod! I wish I could've gotten some better photos, but I like to return fish to the water as quickly as possible. 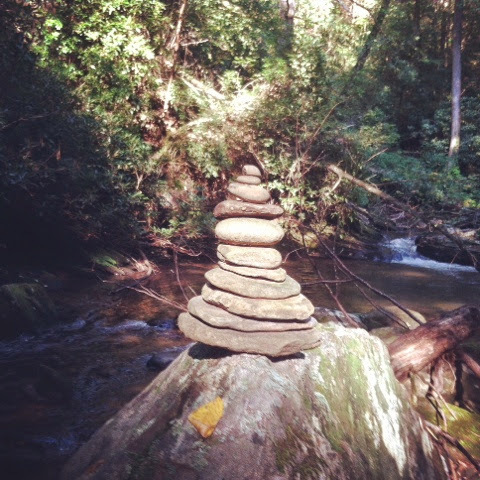 I had a great day fishing the Upper Chattahoochee WMA and definitely plan on returning. 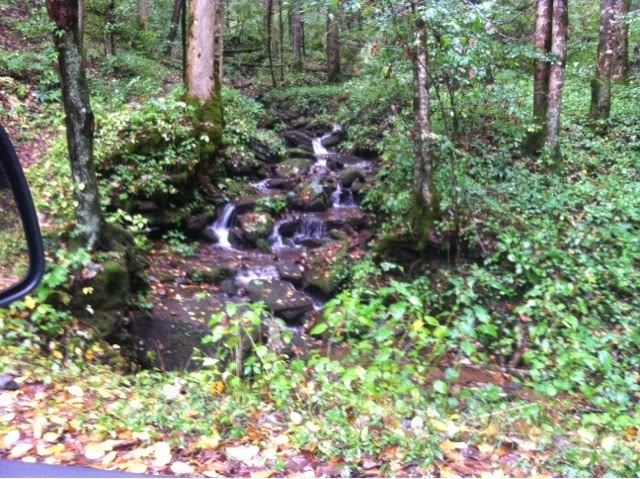 Next time I want to do some more exploring of the smaller streams. The TFO Finesse Half Weight and Galvan Brookie both did a great job and a shorter rod made fighting through the brush so much easier! Tight lines and dry feet! 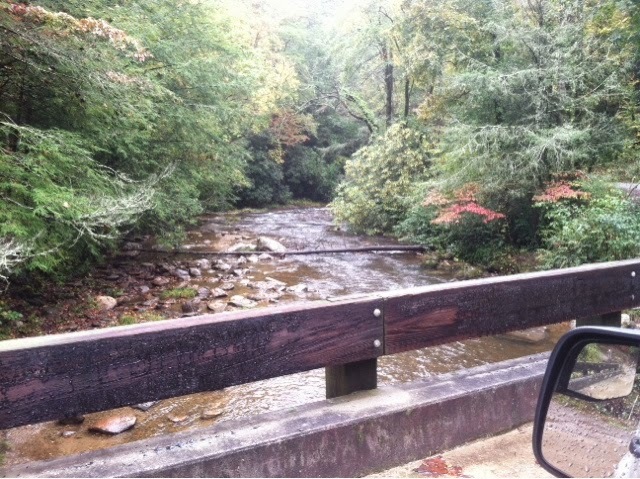 I wonder if there are any trout holding pools upstream? Fantastic combo! TFO Finesse Half Weight and Galvan Brookie. Stunning colors on these little rainbows! My first brown! What a beauty! 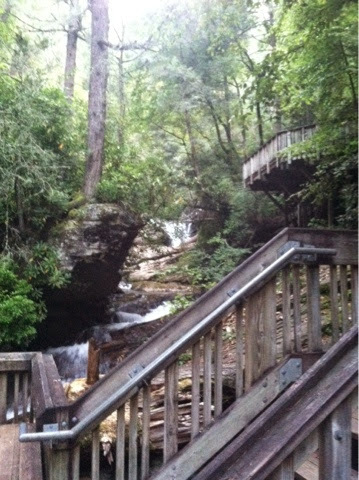 Gorgeous scenery in the Upper Chattahoochee WMA. Fall color is just beginning. I just wanted to write up a quick post to tell you guys about the fantastic time I had yesterday! I was able to secure the day off from work, so as soon as I got home from my morning class (Calc II, bleh) the Little Girl and I hopped in the car and headed to the Buckhead area of Atlanta. 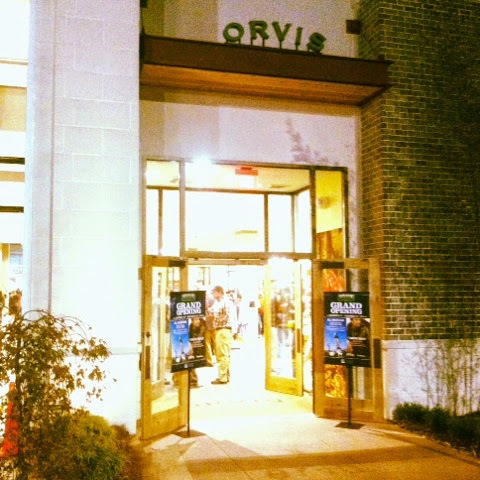 At 12:30, the voice of Orvis fly fishing (and fly fishing in general) himself, Tom Rosenbauer, was giving his Small Stream presentation at the Orvis Atlanta store. I got there a bit early to double check the start time and see how big the crowd was going to be. 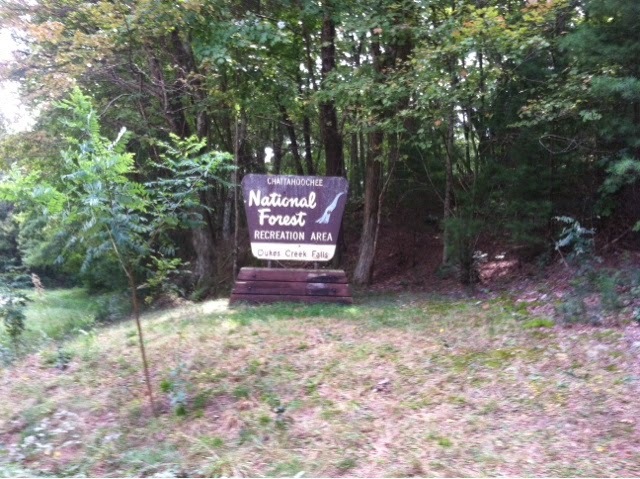 To my surprise, I was immediately introduced to Tom and had the opportunity to talk to him about suburban bluegill fishing and small stream trout fishing in the North Georgia mountains. It was such an honor for me to get to speak with him one-on-one, he is such an incredibly nice man, very generous with his knowledge, just as you would expect from listening to the Orvis Fly Fishing Guide Podcast. I really regret that I never thought to have my picture taken with him, but I do hope to get to meet with him again someday soon! His presentation was excellent, just like listening to the podcast, but with pictures, and he was able to answer questions as they came up, instead of waiting for the next podcast to be released! I don't want to give away all his secrets here, but if you ever get the opportunity to attend one of his lectures, you won't regret it! 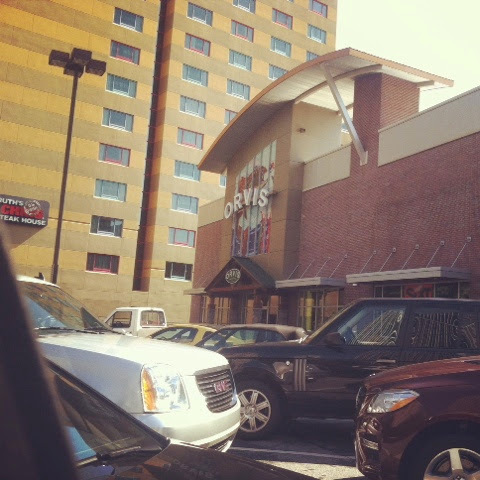 After the presentation, we had to kill a few hours in Atlanta, which seems to be becoming increasingly harder for us to do! 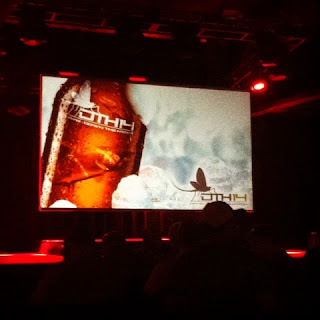 We had to head over to Terminal West at the King Plow Arts Center for the Down the Hatch Film Tour presented by Orvis Atlanta and Sweetwater Brewery. 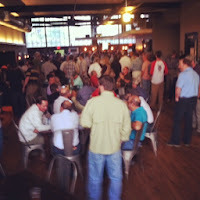 The doors opened at 6;30 for a Social Hour with free beer from Sweetwater and some passed appetizers and finger foods. There was a guitar trio playing some great classic country music to set the mood and some shirts and jackets being handed out to the ladies in the crowd. 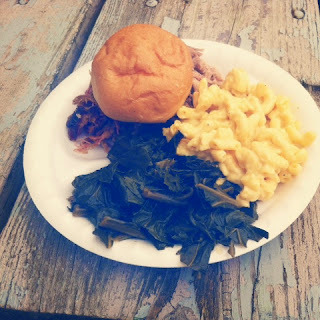 The proceeds of the event went to support the Chattahoochee River Keepers, they had a booth set up and were giving out some goodies in exchange for signing up for their newsletter. 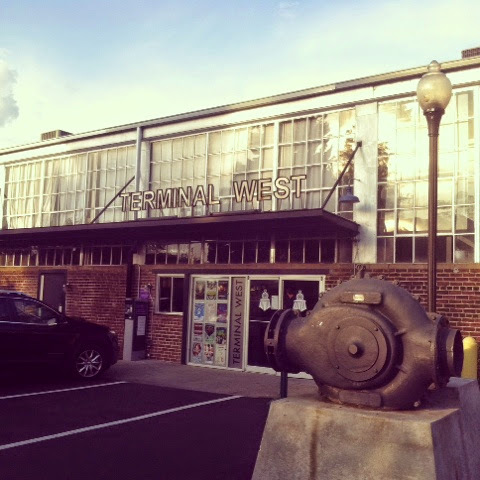 The entrance of the Terminal West facility at the King Plow Arts Center. There were 300 tickets sold, which meant a packed house! The films that we got to watch were just awesome! The videography was incredible and the scenery and fish were amazing. I was hoping to find a list of the films, but was unable to by the time I wrote this post. If I can find it, I'll try to get it posted. One of the films showed clips from vintage fly fishing movies. If you know me, you know that I tend to love anything old, and the old footage was right up my alley! I'm pretty sure I recognized Joan Wulff and Lefty Krey in some of the vintage scenes. I'm going to have to start digging around and see if I can find those old videos to post here on The Suburban Angler. 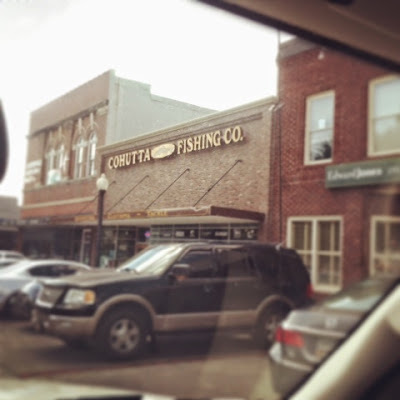 The last film shown was a hilarious dramatization of what we all feel when we're out fishing with a buddy who catches every fish in the stream, while we're left empty handed for the day and almost ready to snap a rod in frustration! While the films were my favorite part (partly because I didn't win anything), I think the raffles are what really brought the crowds out. The price of the admission ticket also included one raffle ticket for each guest. During the intermission of the films they drew numbers to give away several guided fishing trips that covered just about every fresh and saltwater fish species in the Southeast and a great looking wooden Sweetwater Brewery sign. 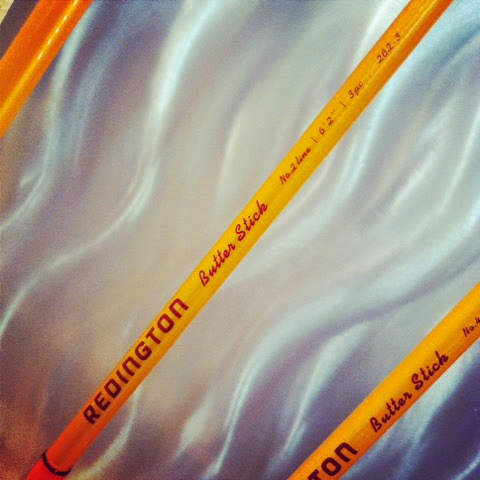 But, the grand prize for the raffle was a brand new Sweetwater Brewery logo'd Orvis Helios H2 fly rod. You had to be present to win the raffles, and it took 3 or 4 tries before they gave away the rod. I think every one in the room was on the edge of their seat, clutching their ticket! If the gentleman that won the rod happens to read this and decides that it's not for him, I'd be happy to take it off his hands!!!!! In case you can't tell from the post, we really had a great time. 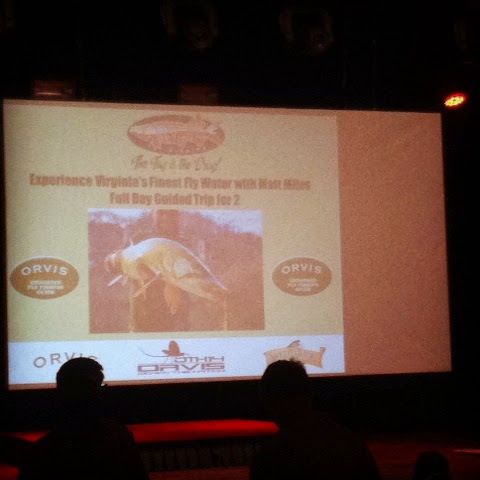 Orvis Atlanta and Sweetwater Brewery put on an excellent event and I can't wait for the next one! 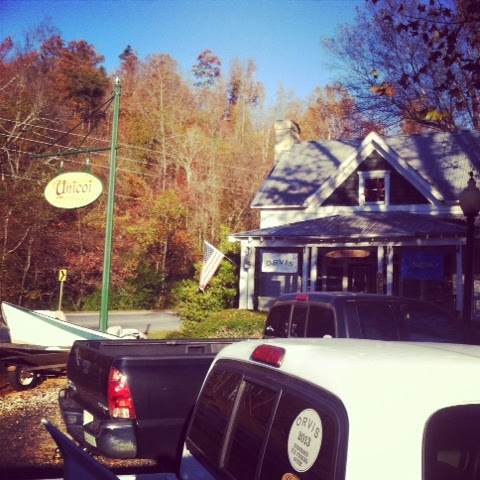 They announced during the intro that the Down the Hatch event raised over $5000 for the Chattahoochee River Keepers! I'm so glad that I got to be a part of it! If one of these film tours comes to your neck of the woods, you should really try to go. I promise, you won't regret it! Tight lines, cold beers and great films! Our swag! Who doesn't love free stuff?